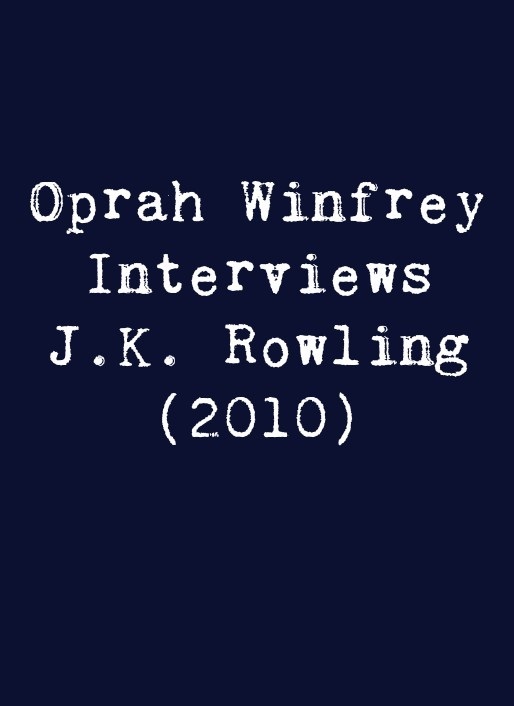 These facts are all from the opening scene of the 2010 Oprah Winfrey interview with J.K. Rowling. Some of them are dated; meaning that they have changed. We all know that J.K. Rowling has sold many more books since the year 2010. However, they are still fascinating facts. 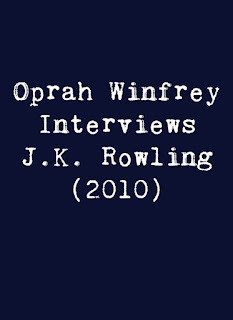 If you missed it, you can watch the Oprah Rowling interview here. J.K. Rowling has sold 400 million books. J.K. Rowling is the first self-made BILLIONAIRE author in history. J.K. Rowling's books have been printed in 69 languages. J.K. Rowling's books have been released in 200 countries. Harry Potter book and the Deathly Hallows was the fastest selling book ever. The Harry Potter franchise is the highest grossing movie franchise in Hollywood history. Are you in awe of what J.K. Rowling has achieved? Are you thankful for her contribution to the literary world? 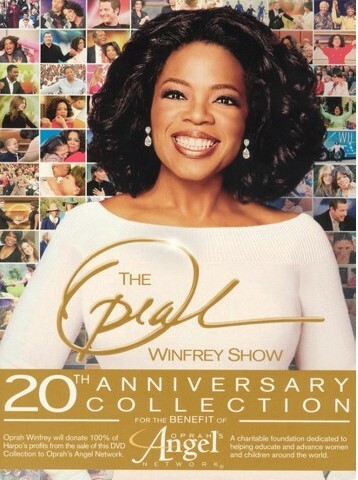 Did her work have an impact on the lives of you and/or your children? I am, I am, and she did. I look forward to hearing from you! If you are a parent of a little girl, you are likely aware that Disney's Frozen movie is hugely popular with that age group. It may be a while before Disney releases another female-focused movie that surpasses the success of this film. When little girls started falling in love with the two new Disney princesses in this film, Elsa and Anna, the merchandise sold quickly and retailers did not have enough Frozen merchandise on hand. Fortunately, those days are past and now there are lots of great Frozen-themed gift ideas readily available. If you have someone young or young at heart in your world who is in love with Frozen, you will enjoy these fabulous, officially licensed Disney gift ideas. Which Frozen Items Did I Pick? In the toy category, I have included Anna and Elsa dolls, a wonderful Lego set and a great jigsaw puzzle. All are gifts that are fun to play with. I have included items that can be used in everyday life including a t-shirt, a coffee mug and a calendar. They are fun as well as practical and affordable gift ideas. I chose one expensive, really nice item that will be treasured by the recipient forever. It is a beautiful musical snowglobe. Elsa's Sparkling Ice Castle, set 41062, was the first Frozen-themed Lego set. It is not an overly big set, having 292 pieces but features what you need to recreate the ice castle as well as the minifigures of Elsa, Anna and Olaf. 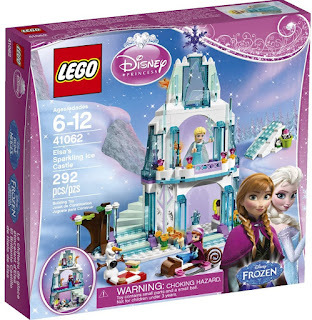 It is rated for children aged 6 and up and I think that it is a great choice for the little girl who loves building and Frozen. Click here to see all of Lego's Frozen themed sets on Amazon. In our opinion, the Disney Store makes some of the nicest coffee mugs out there. In the case of the Frozen mugs shown here, you can choose either the blue or the pink one or you can choose both. 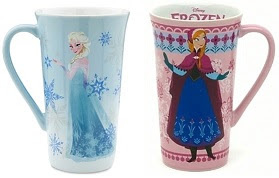 You can check out all of eBay's Frozen Anna and Elsa mugs by clicking here. My family loves puzzles. We have always enjoyed working puzzles together and, when our guys were little, I particularly appreciated the fact that working a jigsaw puzzle is a fun and affordable family activity with a bonus educational benefit. Don't tell your children! The puzzle shown here has three small 49 piece puzzles in one box and is recommended for children aged 5 and up. You will find one image of Anna, one of Elsa and one of everybody's favourite snowman, Olaf. 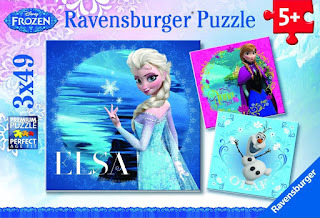 You can see all of Amazon's Frozen themed jigsaw puzzles by clicking right here. A t-shirt is definitely an affordable and practical gift idea, one that can be used all year. 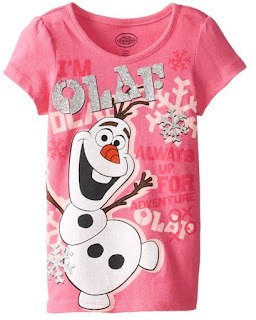 I Love, LOVE, love this pretty pink Olaf t-shirt. What Frozen fan would not want to add a t-shirt like this one to his or her collection? This one is a girl's shirt available in sizes 2T to 6X. You can find this t-shirt on Amazon by clicking here. You can find a Frozen-themed t-shirt for everyone on your gift buying list on Amazon by clicking here. You can celebrate Frozen all year long with a wall calendar. 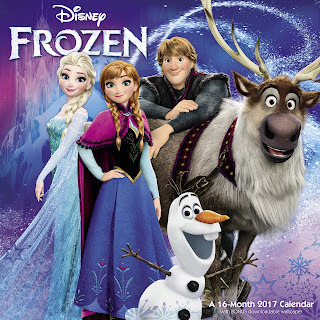 A calendar is yet another affordable and practical gift idea and a Frozen-themed calendar makes a great gift idea for a slightly older fan, one who can put a wall calendar to good use and who will enjoy decorating a room with it. 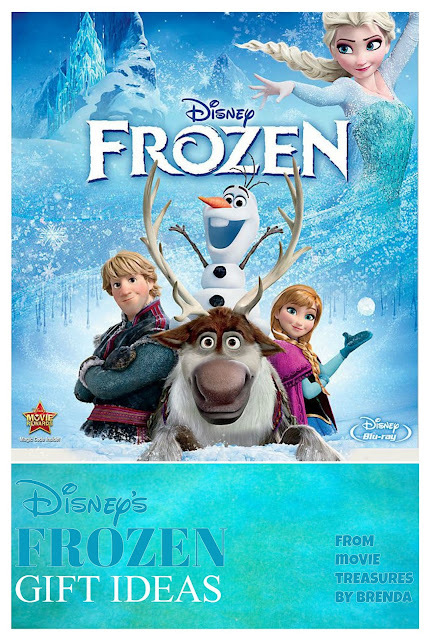 Find all of the current Frozen calendars here on Amazon. You and, more importantly, your little girl will recognise Elsa and Anna, dressed as they are in these beautiful outfits from the movie. 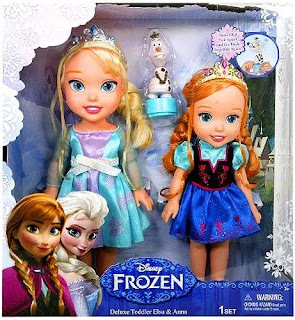 These dolls are Disney's Deluxe Toddler Elsa and Anna and suitable for Frozen fans as young as three years old. Find them here on Amazon. If you are looking for something really, really special you might want to consider this beautiful Disney Store Anna, Elsa and Olaf Let It Go musical snowglobe. 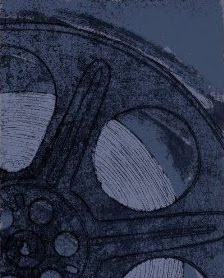 You can find it on Amazon by clicking right here. See all of the Frozen-themed snowglobes here. Will you be giving someone a Frozen themed gift this year? 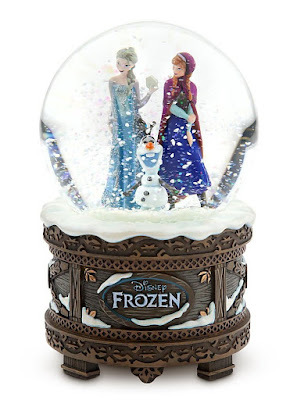 See all of Disney's Frozen products on Amazon. Disney's Frozen Elsa Swarovski crystal figurine is magnificent. Learn more about it here. 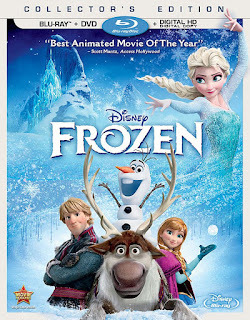 The original Disney Limited Edition Frozen dresses are amongst the highly sought after merchandise from this movie. Learn where you can find one...and at what price. A page full of Walt Disney collectibles and gift ideas! If you're looking for a Disney themed dress for your little princess, consider a Disney Princess nightgown? They do double duty as a dress-up costume and as pjs.